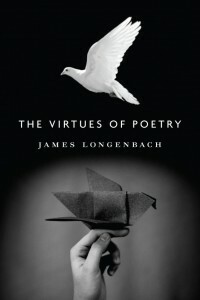 My admiration for James Longenbach’s new collection of essays, The Virtues of Poetry, has everything to do with this poet-critic’s bifocals, his capacity to take the short- and long-view simultaneously and with equal rigor. It’s a bird’s eye intimacy, made possible by a kind of thoroughgoing poetic piety, an abiding reverence for the poets under discussion. We’re talking Shakespeare, Marvell, Donne, Blake, Dickinson, Whitman, Yeats, Pound, Eliot, Stevens, Oppen, Bishop, Lowell, Ashbery and Glück. No surprises there. But these canonical pillars are strangely illumined in Longenbach’s loving hands. The best metaphor I can fashion is but a poor one: the austere Professor Longenbach is bear-hugging a poem, say, “The Wild Swans at Coole,” and his intimate grip slips into a groping, some heavy breathing, but his head is firmly hooked over the poem’s shoulder—all the while he’s looking beyond this moment’s monument to poetry’s past and future. Longenbach argues that readers engaged in close, appreciative reading can identify various poetic “virtues,” effects endemic to the language itself, that when employed in varying degrees and in varying combinations, are responsible for our English poetic tradition. Whereas a lesser book on “craft” might feature chapters on enjambment, repetition, or “music,” Longenbach’s skill as a critic and essayist impels consideration of virtues more complex and vital: “boldness, change, excess, inevitability, intimacy, otherness, particularity, restraint, shyness, surprise and worldliness.” What I find irresistible about these “virtues” is how they marry particular and localized linguistic effects—those of diction, syntax, prosody, etc.—to something more akin to Faulkner’s old verities—love and honor and pity and compassion, etc. Longenbach knows well poetry’s great lesson, that we arrive at the large and consequential by means of the small, shored fragments of experience. As a result, we’re treated to insights like this, concerning allusion in The Pisan Cantos: “the poem’s excess, like any poem’s excess, is driven by the wish not to die.” Or this, on diction: “The language of Stevens’s poetry partakes, in small ways, of this consolation….the assurance that the natural world will prevail in spite of the human potential for destruction.” Hell yes. in which a legion of imitators have by and large gone after the preachiness or giddiness that were more prominent in Ashbery’s earlier work, transforming it into a method and ignoring the essential shyness that has fueled both Ashbery’s deployment and his dismissal of these protective rhetorics. In the way that Lowell once did, Ashbery has dominated the poetic landscape for the past several decades, but just as very few poets harnessed what was truly most powerful in Lowell, very few poets actually sound like Ashbery, sound at once confident and vulnerable, sophisticated and awkward, bold and shy. For more of that sound, we need to listen to both the living and the dead. The entire book strains to hear those above and below ground. Longenbach encourages us to understand beauty transhistorically, to apprehend these various virtues with such acuity that we come to see the poetic tradition not as a parceled-out lineage of manners, but as a unified engagement with language—a human project—in which various linguistic effects are employed in varying degrees at various times according to the aesthetic/historical concerns of a period and the personal temperament of a poet’s imagination. “Unlike the short term history of taste, which is funneled by reprimand or correction, the history of art moves from achievement to achievement,” writes Longenbach. “Contemporary embodiments of poetry’s virtues abound, and only our devotion to a long history of excellence allows us to recognize them.” It’s a question of Fashion versus Beauty, and for literary critics, what other question is there? I should mention that Virtues of Poetry offers an eminently enjoyable reading experience. Longenbach is a brilliant essayist and exquisite craftsman of prose. What’s more, in between close readings and literary disquisitions, we’re treated to colorful and tantalizing biographical anecdotes. Modernist scholar that he is, Longenbach’s most appealing and vital treatments are of Pound imprisoned in Pisa, and of Yeats marriage to George Hyde-Lees. We also see Dickinson composing the world’s wittiest thank-you note, Stevens writing political poetry, and from a uniquely poignant vantage point, a tender retelling of Bishop and Lowell’s relationship. For any lover of poetry and poetry’s heroes and heroines, for anyone interested in further sensitizing their response to language, the book’s a quick snack. Longenbach is already a successful poet and critic, but with Virtues and his previous efforts of “popular” poetic criticism, The Resistance to Poetry (2004), and The Art of the Poetic Line (2007), Longenbach is upping the ante and setting the standard for smart, palatable criticism. The book is out now from Graywolf.